Coaches often play favorites in sports. They may “start” the same players every game. Or they may spend more time giving feedback to certain kids. They may give their favorites more playing time than other children. Often, coaches prefer players who show up on time, try their hardest and score during games. They sometimes favor players whose personalities mesh with their own: Communicating with these children feels easy. If your child isn’t one of the coach’s favorites, you should begin by telling your child that it’s pretty normal for coaches to favor some children over others. But that doesn’t mean your child is a bad person or a bad player. Tell your child that coaches sometimes prefer kids with certain playing styles or personalities. Be sure to discourage negative behavior. You don’t want your child brewing on the sidelines or making faces while he or she is warming the bench. Instead, your child needs to try to understand what he or she can do to improve the situation. Help your child discover what the coach wants from him or her. Talk to the coach, says Dony Wilcher, a former Division I basketball player who is program director for Showtime Athletics, a youth-sports organization in Portland, Ore., “Most coaches are pretty approachable. Sit down with the coach. See what the coach is looking for in the child. Does he want a role player, a star player? Does he want your kid to take more left-handed? jump shots?” Understand that you may not change your coach’s behavior by talking to him or her, but you may enhance communications. Be sure to be respectful and courteous. If the coach’s requests seem reasonable, encourage your child to work as hard as possible to meet the coach’s requests. Tell your young athlete to make every minute of playing time count. 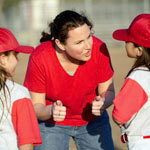 Encourage your child to show the coach that he or she is trying to meet his expectations. Tell your athlete to get out on the court or field and do his or her job-and to have fun doing it. A child can improve and have fun in sports even if he or she isn’t the coach’s favorite. However, it’s always possible that your coach is not a right for your child. Parents should always ensure their kids’ coaches are supportive and positive and focus on the health and welfare of the kids.